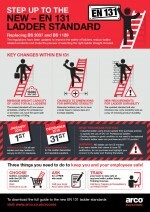 The new regulations seek to reduce ladder accidents, improve worker safety and simplify the ladder selection process. Working at height can be extremely hazardous if the appropriate safety features are not factored in. If workers are involved in such incidents, this can have severe and even fatal implications. Previous British standards for portable ladders and stepladders, BS 2037 and BS 1129, are being revised and replaced with a single British and European standard, BS EN 131. The updated standard contains two categories: EN 131 Professional, for industrial and trade, and EN 131 Non-Professional, for domestic and DIY use. Arco says there are a number of changes that both companies and employees should be aware of including all ladders now having to adhere to the same minimum weight capacity of 150kg, whether it’s for domestic or professional use, and the introduction of cycle durability tests to check product durability. Extension ladders that are over 3m in size will also now be required to have a wider base to reduce slips and the risk of ladders flipping or toppling.